People talk a lot about poker tells but they usually mean at the casino, live poker. What a lot of people don't realize is that you are giving off just as many tells (if not more) in online poker. And amateurs in particular are giving off these tells all the time. Poker pros like myself are constantly picking up on these and using them against you. So in this article I am going to give you the top 9 online poker tells that you probably didn't even know you are giving off. One of the most obvious online poker tells is the big blind auto check. And what I mean by this is somebody who has used the auto check/fold button to automatically check (and fold to any raise) when the action finally comes around to them. This is a feature that is available on most online poker sites. Many people will look down at a crappy hand and just use this auto check/fold button to save time because they know they aren't going to raise or call a raise. If you currently use this button then I would highly suggest that you never, ever, ever use it again! Why? Because for anyone paying attention to timing tells like me, you have just given away the strength of your hand. I know you have something crappy that you weren't even considering getting involved with. Always wait until the action comes to you in the big blind before deciding what to do. It might seem like a little thing, but you can't afford to give away free information like this to other good players. Another common tell that you see from recreational poker players in particular is posting the blind right away when they first sit down at the poker table (not waiting for the big blind to come to them). Not only is this silly because you end up paying the blinds an extra time which adds up huge against you in the long run. But you have just announced loud and clear to the entire table that you are a fish. Good poker players will always wait for the blinds to come to them when they join a new table. Recreational players on the other hand are impatient and will foolishly pay the blinds twice. Limping (just calling the blind preflop) is another huge tell that is even more important in online poker than live poker. And that is because virtually no good players will ever limp online. And that is because it is simply a proven fact that limping is a losing play. All you have to do is open up PokerTracker and filter for hands when you limped versus hands when you raised, and you will see the results for yourself. When I see somebody limp in an online poker game it basically tells me straight away that this isn't somebody who is serious about the game. While they might not be a total fish, they aren't likely to be a good player. Another very common preflop online poker tell is calling a raise very quickly or right away. What this tells me is that you didn't think your hand was worth a re-raise but it was definitely not worth folding either. Make sure that you take the same amount of time to act preflop whether you are calling or re-raising. Because when you call too fast, it tells everybody at the table that you don't have something really good. The exact same online poker tell applies after the flop as well. These are some of the most common timing tells that people give off. That is, calling way too fast. This once again tells me that your hand isn't good enough to raise with but it is too good to fold as well. You can't afford to give away free information like this to good players. Always make sure that you are taking a similar amount of time to act after the flop no matter which decision you are going to make. Because when somebody auto-calls me on the flop this basically gives me the green light to just go ahead and double barrel and triple barrel them like crazy. I know they don't have the hand to call me. People are much more likely to use the chat in online poker when they have the nuts. This is actually the exact opposite of live poker. In live poker, they are more likely to be chatty when bluffing and stone silent or nervous when they have the nuts. So when somebody starts taunting me in the chat in online poker to just fold my hand already then that is exactly what I am going to do! This is because people love to get smart in online poker and try to use "reverse tells" on you. In other words, they tell you to do the exact opposite of what they want you to do. Anyways, good poker players see right through these little games. The best thing you can possibly do in online poker is just remain completely silent whether you are bluffing or have the nuts. Just let them keep talking. Another one of the most hilarious and ridiculously transparent tells that online poker players give off is the speech and then the big raise, especially on the river. This is the easiest fold in the world, they have the nuts every time. Once again, this is one of those silly little "reverse tells" that amateur online poker players love to try and pull on you. Basically they are trying to sound like they are sick of being pushed around and they are finally going to take a stand. When in reality they just have the stone cold nuts. Don't ever fall for this nonsense. Just like with the previous online poker tell, remember that it's easy to make up all these little stories when you don't have to look somebody in the face. The reality is that people are much less likely to be bluffing overall in online poker especially at the micros. When they put in the big river raise (even without the big speech), trust me, it's the nuts. Another online poker tell that I have for you is a dead giveaway for a recreational poker player that you have probably seen many times before. And it has to do with their stack size. First off, if you ever see somebody buyin for something totally bizarre like $7.53 at an NL10 table online mark that player as a fish immediately. They have just bought in for their entire bankroll. No good poker player would ever do this. Also, if they fail to top up their stack when it falls below the max buyin this is also another very obvious online poker tell for a non-serious and likely recreational player. Good players will pretty much always use the auto-top up stack option that is available on almost all online poker sites. The final online poker tell that I have for you is to check their table count. On many poker sites you can search a player and it will show you exactly which tables they are on and what games they are playing. By the way, as a quick aside, most poker sites that have this option will also allow you to block yourself from search. I highly recommend blocking yourself. Remember, don't give them any free information...ever. Now here's the rule. Recreational poker players are much more likely to be playing a very small amount of poker tables, one or two. This isn't always the case, sometimes good players will only want to play one or two games as well. But it is true most of the time. And any time I see somebody playing 10 or more tables, this is basically never a recreational player, it's a regular. People who take poker very seriously are going to be multi-tabling like this. So there you have some of my top online poker tells. Honestly, there are so many more that I could have easily rattled off 10 or 20 more. The bottom line is that if you play a lot of online poker you need to always be looking for this free information that people are giving off. Watch if they take way too long to act or act way too quickly. Watch for limpers, people who post a blind out of position, have some weird stack size or get too chatty in the chatbox. And of course you should always be on the lookout for any online poker tells that you are giving off yourself. Always remember, no free information ever! 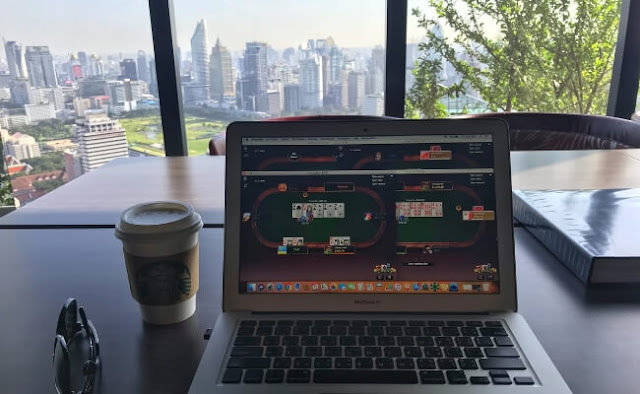 Let me know your top online poker tells in the comments below. Lastly, if you want to know even more about how I read people online and created some of the highest winnings in history at the micros, make sure to download my free poker cheat sheet. Great article. I especially like the tip regarding not posting your blind out of position. If im not mistaken,there are apps that will delay your actions by a predetermined amount of time like fold any bet,call any bet etc,usefull for mass multitablers so they wont wont away time tells.I dont use any because i play max 4 tables.Yeah i know its not much but its not auto pilot either. Oh wow, that is a great idea. I will have to look into that. Thanks Jimmy! Yea, you're awesome. Especially when none of these tips apply. Lol! Was curious what your thoughts on a snap raise are. Like you Cbet flop and guy just snap raises you. Also do you find the tell to be different if it is a snap minraise? I usually see that as being a decent hand but not the nuts. Maybe the guy has 99 on a 742 board for example. Snap mini-raise, same thing. Decent hand or draw. I feel like a really, really strong hand or a bluff would take more time to think. 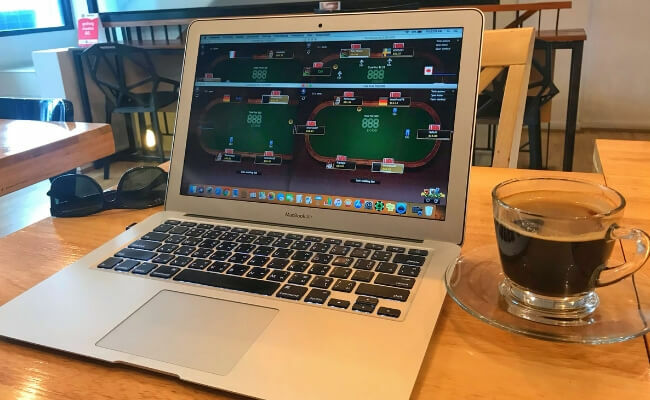 "So in this article I am going to give you the top 9 online poker tells that you probably didn't even know you are giving off". I knew about these, and never did any of them as a lot applies to live as well. "Because when somebody auto-calls me on the flop this basically gives me the green light to just go ahead and double barrel and triple barrel them like crazy. I know they don't have the hand to call me". Insta-call on the flop can also mean Nuts. They flopped a Full or Quads and know they'll call. It can also mean multi-tabler who isn't giving this hand priority. Maybe you can take it away from him. It could mean that the caller has some small or medium pair and expects you to have (A,K) or (A,Q) on a board without an ace, king, or queen. Triple barrelling that guy will prove costly if you do, indeed, have a Big or Little Slick that missed. For sure, perhaps I should have been more clear in this article that none of these tells are true 100% of the time. In fact, really smart poker players these days will try and use reverse tells against you as well. Seems like the auto-check in BB can be used both ways, though. At micro levels, they’re not paying attention and it’s always going multi-way. Sometimes your hand becomes suddenly threatening after a 379r flop when you auto-checked. Plus, under 50NL, I’m going for showdown value all the way, anyway. I don’t really care if my auto-check looks weak because I probably have to lead with a check OTF anyway. When playing live against other regs,try to balance the time you take whenever doing anything.Instashove or insta check jam,3 bet/4 bet / the other day take 10 seconds to do the same thing in similar situations.Works wonders.Bye bye timing tells. There is no question that you always give away a bit of information when multi-tabling for the sake of efficiency. But even when multi-tabling I still for example never use the auto-check big blind button. I want people to know that I am still going to fight for my blinds frequently. Great Info. I have a question concerning the auto-top off. I’m a decent reg on GP and I manage my online bankroll closely. However, I take shots here and there. The stakes that I’m bankrolled for I’m multitabling 6-9 tables with auto top off, but when I move up I want to manage the most I can lose, so I’ll play 2 tables max. Currently at 50NL with taking shots at 100NL. Thanks Joseph glad you enjoyed this article. There is no problem playing fewer tables when you move up, if I understand that to be your question. In fact I would recommend it. Thanks for another great article! I was wondering if you had any experience playing in mshunl games, and if you could write an article about the game and common mistakes new players make? Ive played a few games and am running about break even, but want to be beating these lower stakes before moving up to $5, $10, and hopefully $25 games. "What a lot of people don't realize is that you are giving off just as many tells (if not more) in online poker." Even more telling is using the auto check-fold button postflop. This tell everyone, you are so disinterested in your hand, you will not even consider calling any bet regardless the size. If I check, and it gets autochecked behind, I am betting the next street like 100% of the time.